Nootie, a company specializing in quality dog care and wellness products, has revealed a lifetime money back guarantee is available for its recently launched Glucosamine Chondroitin Dog Treats. This proves the company’s confidence in the product’s effectiveness and safety. Available in a package of 120 soft chews, glucosamine for dogs is a non-diluted formula that relieves pain from arthritis, dysplasia, and other conditions while protecting joints from future damage. It has been proven to work on dogs experiencing joint pain and reduced activity for years. The product is available now for $39.97 for a short time and with free shipping on orders over $35. It includes pure methylsufonylmethane, chondroitin sulfate, and hyaluronic acid which are absorbed into the blood stream along with fish oil, flaxseed oil, glycerin, ascorbic acid, and other healthy compounds included in the chewable treats. The ingredients begin to work immediately once absorbed so canines can experience pain relief and become more active soon after the product is administered. All ingredients are preserved when the glucosamine chondroitin for dogs is kept in a cool, dry place. Recommendations include giving dogs the product after a meal, at specific dosages in the first 4-6 weeks and on a maintenance schedule thereafter. The actual dosage depends on size and instructions are provided on the back of the container. For smaller dogs, benefits can be seen with as little as one-half a chew per day. Any breed of canine can benefit from the supplement. 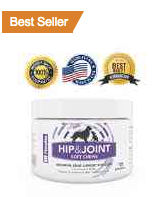 The glucosamine chondroitin for dogs is available on Amazon now. Customers can therefore take advantage of all the perks of ordering on the site and also the money back guarantee offered by Nootie at any time. Nootie is a retailer of dog treats and shampoos as well as anti-itch sprays, fragrances, and wellness products for all sizes and breeds. Starting with lasting, scented shampoos for dogs, the company now supplies a complete line of healthy, grain-free treats. Its pure, safe glucosamine chondroitin supplement helps aging dogs with arthritis and chronic pain. All products are made in the U.S.A.